Read part 2 of this series here. Capt. Joe Kittinger prepares to launch in Man High I (Credits: USAF). NASA wasn’t even a year old when, in 1959, Dr. John Stapp’s Project Excelsior set out to see if a man could survive a high-altitude free-fall. Capt. Joe Kittinger piloted three gondolas skyward from Holloman Air Force Base, New Mexico, and then stepped outside to plummet back to the white sands of the Tularosa Basin. Project Excelsior followed Man High. According to Gildenberg, NASA, in the early years of the Cold War-era Space Race, “was getting most of the” coveted government “funds,” which negatively affected Excelsior. “We just ran out of money,” Gildenberg said. Several documented sources cited that Stapp borrowed cash from the balloon maker, Winzen Research, whom the government never repaid. Kittinger’s Excelsior I ascent was on Nov. 16, 1959. “(Duke) had advised us to initiate our test flight somewhere to the west of Holloman so that the westerly winds aloft would blow us over White Sands Missile Range,” Kittinger wrote in “Come Up and Get Me” (UNM Press/2010). Kittinger piloted Excelsior I to 76,000 feet before free-falling and parachuting. The jump was almost fatal. His small parachute, which should have stabilized him, opened automatically after only two seconds of free fall because of a 16-second delay exiting the gondola. Kittinger spun 120 revolutions a minute and lost consciousness. Only his emergency parachute, which opened automatically at 10,000 feet slowed his descent. “When I came to, I was floating lazily down beneath the beautiful canopy of the emergency chute. I want to tell you I had a long thank-you session with the good Lord right then and there,” Kittinger wrote in the Aug. 29, 1960 Life magazine. Excelsior II, which lifted off on Dec. 11, 1959, “rose up to 74,400 feet without incident,” Kittinger wrote. He “landed gently in the desert sand,” he said, with “no drama, no worries.” Excelsior III was a far different experience. 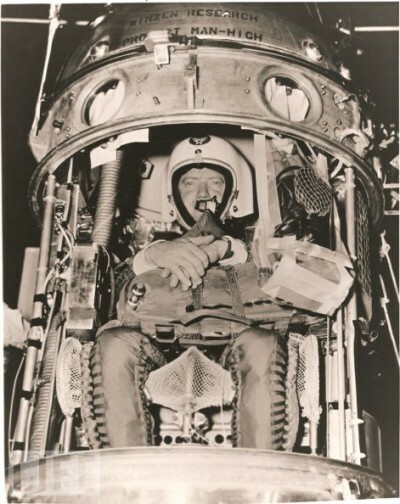 Kittinger left the Earth at 5:29 a.m. on Aug. 16, 1960. At 43,000 feet altitude, he realized his right glove was failing to pressurize. He chose not to inform his ground crew. Excelsior was out of funds. An abort would mean the program was over, and Stapp would have aborted the mission to protect Kittinger. “Duke Gildenberg, who had never brought a balloon down more than a quarter mile from its target, asked that the balloon float at that altitude for 11 minutes while it drifted over the preferred drop site 20 miles below,” said The Pre-Astronauts (Naval Institute Press/1995). Less than two hours after liftoff, Kittinger stepped out of his gondola. His hand has caused him problems, but he landed. On Nov. 12, the competition’s first day, Gildenberg advised Kittinger to hold off launching for more than 24 hours, even as competitors took to the air. Erratic weather patterns ended up taking the early balloonists west instead of the hoped-for east, where the first to reach New Jersey would claim the $100,000 prize. Twenty-four hours later, stalled winds forced them down. On Nov. 13, Gildenberg would still not give thumbs up. Finally, the next day, he said go. “At 12:59, one minute before the deadline,” Kittinger rose into the sky,” Come Up and Get Me said. “I planned to contact local radio operators and have them call Duke in New Mexico to get his recommendations on optimum altitudes for the best wind patterns,” Kittinger wrote. Three days later, Kittinger encountered a snowstorm. Seventy-two hours and 2,033 miles after leaving Las Vegas, Kittinger landed on a pig farm in New York. He hadn’t won the $100,000 prize (no one did), but he did set a long-distance balloon record. Gildenberg had retired in 1981, he said in his oral history, but that didn’t last. Within two years he was working as a contractor and consultant on various projects. For the remainder of his life, until he died in early 2013, Gildenberg made his home in Tularosa, New Mexico, as “a cattle rancher.” From there you can see White Sands Missile Range and Holloman. The skies above both were where he’d plied his trade, and helped to prepare space for future astronauts. This concludes the story of Duke Gildenberg. If you missed the beginning of the series, you can start from Part 1, aviailable here. Michael Shinabery is an education specialist and Humanities Scholar with the New Mexico Museum of Space History. E-mail him at michael.shinabery @ state.nm.us. We are a magazine-style web site devoted to the coverage of space, with an emphasis on personal and commercial spaceflight. We endeavor to document the dawn of this new epoch and encourage career choice in space-related fields. Content from moonandback is provided to Space Safety Magazine by agreement with Moonandback Media LLC.